Raymond has translated a phone interview Yao gave Saturday night to Titan Sports after the announcement was made he’s out for the playoffs. Check it out here. Last night I asked Carl Landry in the locker room what the Rockets would have to do different if they weren’t able to play with Yao. At the time I thought the chances were slim they’d have to worry about that. Now it’s a reality. I messed up by asking him what they would have to do in “Game 3” when I meant “Game 4.” Here’s what he said. I predict the Rockets will surprise lots of people and really put up a great fight. Landry will become even more aggressive, similar to what we saw during the 22-game winning streak last season, Luis Scola will become more of a scoring machine again, the Rockets will spread the floor and Aaron Brooks will have more open lanes to get to the basket like he did in Game 1, Kyle Lowry and Von Wafer will do the same, Brian Cook will get some playing time (and hopefully haunt his former team), Shane Battier will become more aggressive offensively, and Brent Barry will even see some action and hit some shots. Essentially, the Lakers will think they’re going to win now that Yao is out and take Houston lightly, meanwhile the Rockets will come out like an animal backed into a corner, and the Rockets could win a game or two…and hopefully three! Rockets center Yao Ming was ruled out for the remainder of the sesaon after a hairline fracture was found in his left foot Saturday evening. The Rockets had hopes he could play Sunday in game 4 in their series against the Los Angeles Lakers, but additional diagnostic tests found the fracture. The hairline fracture will not require surgery but will require an eight-to-12 week rehabilition. This is the third consecutive year that Yao’s season was interrupted or ended by a fracture of a bone. 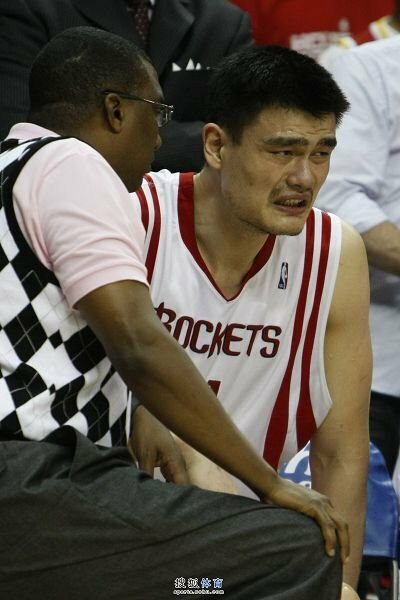 Another hairline fracture for Yao! Just heard the news. I can’t believe it…again! He’s out for the playoffs! More news shortly. 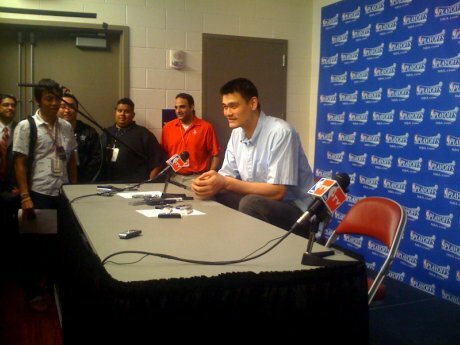 I recorded the full audio from Yao’s presser last night, which is about 4 1/2 minutes long. There’s actually a funny moment at the end when he responds to ESPN’s Lisa Salter’s question about his injury. So far there’s no word on the results of Yao’s “running test” that happened this morning. There’s also a question asked in Chinese to which Yao responds in kind, so if anyone wants to translate it, feel free to provide it in the comments. I have a few more interviews with Shane Battier and Carl Landry that were recorded in the locker room that I’ll provide later (these take a long time to upload). Check back a little later for those. The Rockets’ locker room after the game was dead silent after their 108-94 loss to L.A. to lose home court advantage in their playoff series. Yao was sitting there with his feet in a bucket of ice, looking straight ahead at the floor dejected. We all knew there was a problem with his foot or ankle as everyone saw in the fourth quarter as he hobbled around, but I felt a little better when I saw Shane Battier with his feet in a bucket of ice, too. This is a routine for some of the players, so maybe it’s not too big of a deal…at least I’m hoping it’s not. Yao said after the game he doesn’t remember exactly when he hurt his foot or ankle, but it was sometime in the second quarter, and it kept getting worse as the game wore on. I doubt it was one of the reasons why he missed a few point-blank layups and dunks, though. We thought those kinds of games were long gone from Yao. Even with those missed opportunities, he was just one shot shy of shooting 50%, hitting 6-of-14 for 19 points. Yao Ming’s left ankle or foot was hurting at the end of Game 3. 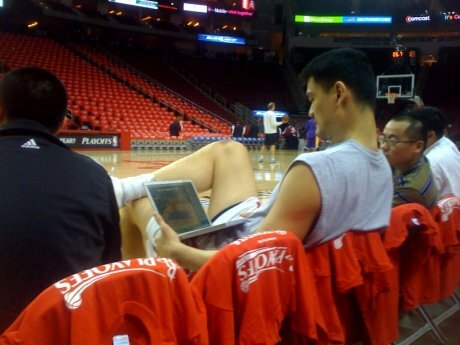 Click here for more photos of Yao nursing his foot. So we all wait with baited breath to hear what the prognosis is for Yao’s ankle (or foot) on Saturday. He said he is going to do a “running test” in the morning. Hopefully this simple routine test along with maybe some customary X-rays or whatever doesn’t turn into something major like last year when he was going to get a simple MRI on his foot because of some minor pain, only to have it turn out to be a stress fracture that sidelined him for the rest of the season. That’s the last thing we need to hear after he had such a relatively healthy season, thinking he was out of the woods for awhile when it comes to foot and lower leg injuries. Assuming Yao is going to be okay to play on Sunday in Game 4, let’s talk a little bit about what the team’s problems are that need to be fixed. I still see too many offensive sets that confound me: like Yao setting up on the weak side while either Ron Artest or Luis Scola are posting up (which is fine), but then Yao parking himself on the weakside or along the weakside baseline with 1 or 2 defenders between him and the ball, taking himself completely out of the play as an offensive option. WTF? Even Rick Adelman told ESPN after the 3rd quarter that Yao had to move and be more active and not take himself out of the play like that. So maybe it’s not the sets. Maybe it’s Yao not doing enough, which is difficult to fathom. And we really can’t blame the injured foot/ankle because we’ve seen Yao struggling to get open, especially when he’s being fronted. So this is really the first time I’ve heard so explicitly Adelman saying that Yao’s got to do more. Wow. The way these plays develop remind me so much of the offensively-challenged Kelvin Cato doing the same thing back in the Steve Francis era, waiting for either Francis or Cuttino Mobley to take it into the paint and dish off at the last second for a dunk to him, or waiting for an alley-oop pass. C’mon. Yao’s better than that. Those kinds of plays are designed for big men who can’t shoot and have only one option to score: dunk. Plus, I just don’t understand when I go to the pre-game shootaround like I did a couple of hours before the game, Yao drills jumper after jumper from about 20 feet, THEN NEVER USES IT except maybe once per game, which he didn’t even do Friday night. All things considered, at halftime things weren’t too bad with the Rockets trailing 50-48. Sure, they had 11 turnovers that led to 14 Laker points, but it could have been worse. The Rockets were shooting 49% after a nice first quarter where they hit 58%. The only problem is that they let the Lakers shoot 61% in the first quarter, and didn’t build a big lead when they had to chance to capitalize on LA’s 7-of-23 shooting in the 2nd quarter. Here’s something you don’t see very often. 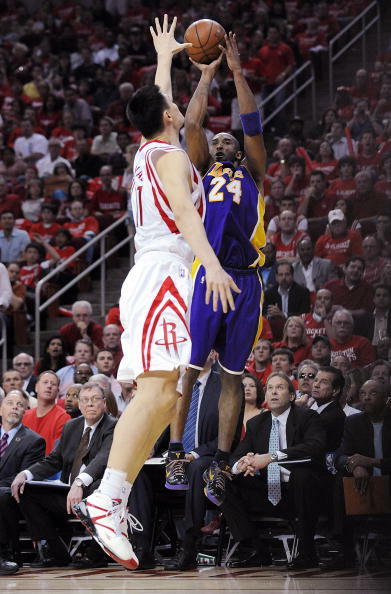 Yao contesting a Kobe Bryant jumper out at the 3-point line. Bryant would miss the shot. Click here for more game photos. Not building a lead came back to haunt them in the 3rd quarter when they hit only 6-of-25 shots for only 14 points, and couldn’t really put the clamps down on LA in the 4th to gain ground. They did whittle the lead down to 6 points with 4:15 remaining, but then Jordan Farmar hit a jumper, Ron Artest missed 2 jumpers, Yao missed a turnaround, and then Kobe Bryant hit a three to make it 95-84 with 2:21 remaining. Artest would cut it to 102-94 when he hit a 3-pointer with 47.2 seconds remaining, still too big of a deficit to overcome, and right after that is when Artest got the “flagrant-2” foul called against him for fouling Gasol on a breakaway dunk attempt. But at that point, I think making up 8 points in that little of time was really improbable, so I wasn’t that upset Artest got ejected from the game. Alot of people seemed to be talking about it after the game, though. And I’m not concerned about Artest getting suspended for Game 4. It wasn’t that bad of a foul. Nowhere near Bryan’s elbowing Artest in the neck in Game 2, and he got off easy on that. There ain’t no way the NBA is going to suspend Artest for Game 4, or Stu Jackson will be public enemy #1 in Houston. L.A. only turning the ball over 6 times compared to Houston’s 17 TO’s leading to 20 points was huge, with Aaron Brooks turning it over 3 times and Ron Artest 4 times. That’s actually par for the course for the Rockets this season against the Lakers — they’ve averaged 18.6 in their 7 games against the Lakers this season. Houston’s 56-43 rebounding advantage wasn’t enough, the first 50-rebound game they’ve had in the post-season, and the first time they’ve out-rebounded an opponent in the playoffs and did NOT win. They also had a 50-32 scoring advantage in the paint, the most they’ve scored in the paint in the playoffs. Another problem is they let the Lakers hit 11-of-20 three-pointers, the second-highest total against the Rockets at home this season. After the game, I asked Carl Landry (4-of-7 for 10 points) how often a bad game like this would happen during the regular season, and he said maybe once every 20 games or so. I can believe that, especially after the All-Star break when I can only remember 1 or 2 games where they couldn’t get it going. What a time for this kind of performance to have happened. This was such a surprise with all the energy and motivation the Rockets had coming into this game from their fans, ready to get payback on Bryant for elbowing Artest, and Fisher plowing down Scola. They didn’t harness or channel this energy to take them to a higher level. No one in Houston saw this coming. They thought for sure that a win in Game 3 was almost a lock. Has doubt now crept into their mind if they can win this series? I’m sure there’s some of that. But one thing about this Rockets team we know for sure: they are resilient and will have a much better showing Sunday afternoon. If it’s not good enough to win, then this series is just about over. Von Wafer really worked up a sweat during the pre-game shootaround. His t-shirt was soaked as he went 1-on-1 with James White for quite a long time. I thought it was a little strange for a player to be working so hard just a couple of hours before the game. Maybe it’s that same kind of work ethic that has finally landed him where he is. Or maybe that’s one reason why he went 2-for-10 in the game and scored 9 points. Trevor Ariza‘s 3-pointers (3-of-4), 13 points, and 4 steals were killers. The Rockets got away with Portland’s Travis Outlaw having a poor series, but they’re going to have to play much better to overcome double-digit scoring from Ariza and all their starters: Odom 16, Gasol 13, Farmar 12, and you-know-who 33. What’s unfortunate is that they still won with Bryant making only 11-of-28 shots, and was only 3-for-9 in the fourth quarter. I’m courtside at Toyota Center before tonight’s brawl..er, I mean, game. As usual, Yao is working hard, coming out at least 2 1/2 hours early for shootaround before anyone else. Just a few minutes ago he finished up watching on a laptop some of the defensive clips put together for him to prep for the game. The guy never stops working. Von Wafer and James White came out afterwards. Von is working up a big-time sweat. Watching him from courtside, it’s unbelievable how high he gets up on his jump shots. Kobe Bryant is Darth Vader. Phil Jackson is Emperor Palpatine. Sasha Vujacic is Jar Jar Binks if Jar Jar were a Jedi gone to the Dark Side. Because he sure pulled the Jedi mind trick on Von Wafer. They were former teammates, the have history. It’s obvious. And Jar Jar already knows how to get under any player’s skin–but particularly Wafer because of how much Wafer wants to show up the Lakers. But Von needs to be careful. He built an NBA career with this season. He can’t go and ruin it now because he can’t let Jar Jar’s antics go. Back to the Lakers as Empire analogy… it doesn’t even have to be science fiction. The Lakers, like any empire in history with their grandiosity and prestige, merely expected to get their way. Game 1 was a rude awakening and, of course, in Game 2, Vader and the Lakers had to regulate with a heavy hand. Which means shoulders, elbows and knees, oh my. This from the NBA rule book that substantiates why Bryant should be suspended for Game 3. Regarding Derek Fisher, it’s almost a foregone conclusion that thug will be suspended. Step up, Stu Jackson, on suspending Bryant with Fisher. It’s long overdue. I was taking all kinds of notes Wednesday night during the game and was preparing for my standard post-game analysis, but after seeing how things went down, I’ve got to put those notes aside for a few minutes. I’ll write about the game itself further down the page. Right now, it’s obvious what the storyline of Game 2 is. It’s not that the Rockets lost 111-98. It comes down to one thing: thuggery. Which is too bad, because before Game 1, you could at least respect the Lakers for being a good team that won games fair-and-square. Maybe all that talk about not being ‘tough enough’ when they lost in the Finals to the Celtics last season had gotten into their heads after losing Game 1 against the Rockets. They were out to prove a point against a tough group of Rocket players that they were going to come out aggressive. In fact, too aggressive. Unfortunately for them, I think it’ll backfire. First, let’s talk about the no-brainer call that the refs got right, to their credit. Derek Fisher throwing an elbow — and body — into Luis Scola was bush league. It was the right call to give him a “flagrant 2” and eject him. You gotta love Scola for then stepping up to the line with everyone booing him and hitting the two technical FTs. It’s just too bad that TNT analyst Doug Collins, who had the benefit of the replay in front of him, was actually complimenting and fawning over Fisher for being a “tough guy” in a good way! If there was ever a time an analyst had to be embarrassed for not even coming close to seeing what the refs saw — a premeditated act with intent to excessively harm another player — this was it. I like Collins, but I’ve heard other fans call into radio shows wondering why the guy is so biased for big name players. I now see what they mean. Of course, the biggest episode was the REFS BLOWING THE CALL BY NOT CATCHING KOBE’S DIRTY ELBOW TO RON ARTEST‘S THROAT, INSTEAD CALLING A FOUL ON ARTEST, AND THEN EJECTING ARTEST AFTER HE CONFRONTED KOBE WHEN THE REFS WOULDN’T DO ANYTHING ABOUT THE CHEAP SHOT! I wish there was a better angle from the other side where you could actually see the full force of Bryant’s elbow hitting Artest’s windpipe. Don’t buy Bryant’s glossing over this with the B.S. line that this is simply “playoff basketball.” It’s called a cheap shot to gain an unfair advantage. Anyone who buys that line is a fool, and I’ve got some AIG stock to sell them. If the refs or league execs had done the right thing after Game 1 and suspended Bryant for what would have been classified as assault and battery on a city street, then maybe it would have sent a message to Bryant that crap like that wasn’t going to be tolerated, no matter how big of a star he is. BUT NOOOO, STU JACKSON AND THE LEAGUE EXECS DID NOTHING AND HE DID IT AGAIN! Now you’ve got the outcome of Game 2 marred because of what happened with Artest reacting, as he’s entitled, after HE is called for the foul instead of Bryant, then doing what Charles Barkley said after the game he thought Artest was entitled to do — go confront Bryant about it. And it wasn’t the initial confrontation that got Artest ejected. It was poor judgment by a terrible official — Joey Crawford — to give Artest another technical that ejected him when he was a far enough distance away from Bryant, still jawing at him for telling him don’t ever do that again. I’m sorry, but when you’re about to give a 2nd technical to a player, if he has separated himself from the initial dust-up, and he’s jawing at another player who just hit him in the throat, you don’t give him a second tech unless he’s having to be physically restrained to keep him from hitting or killing someone. I think if you look at Bryant’s ‘body of work’ in this series, or should I say “ELBOW of work,” Bryant (and Fisher) should be sent a clear message that no matter how big of a star you are, how nice of a guy you may appear to be, or how many playoff games you’ve played, THEY SHOULD BOTH BE SUSPENDED FOR 1 GAME EACH. I think these blows by Bryant will backfire. When he was lighting Houston up with all those jump shots early in the game (25 at the time of the elbow), I was thinking man, this guy is going to torch the Rockets the rest of the series and the Rockets are going to be in serious trouble. But now, I think he has ignited a fire under the Rockets to send them into orbit. I liked how Kenny and Charles on TNT were saying that Houston has tough guys (or “pit bulls”), naming off Artest, Battier, Landry, Lowry, Hayes and Scola as examples. Hell, when the Rockets are getting Kenny & Charles’ respect, you’ve got to think they’ve reached the next level. I agree the Rockets are tough. And I think Bryant has angered them, and Houston fans, such that Bryant will not only hear it at Toyota Center in Games 3 & 4, there will also be some old Evergreen, Colorado signs coming out of mothballs from the Red Rowdies to taunt him. But I think the Rocket players are hopefully going to take it a step further: make sure when they foul him, they will be HARD FOULS that will throw him off his game. His trash-talking a couple of times during Game 2 to Battier saying, “You can’t guard me” will give them even a little more motivation to shut his trap up. Ironically, the little dust-up between Von Wafer and Rick Adelman where Wafer was sent to the locker room after the 3rd quarter has been completely overshadowed by Fisher and Bryant’s bush league plays. I can bet you that Wafer and Adelman are going to be fine. Adelman will probably say on Thursday that he’s just a young player who is passionate about wanting to help his team win, it was in the heat of the moment, and Adelman did the right thing by telling Wafer to go to the locker room to chill. Sure, Rockets fans were disappointed that Yao didn’t get more touches (3-of-4 FGs for 12 points). He got into foul trouble early, legit calls or not, which affected some of that. Yao sat on the bench for about 14 minutes more than normal because of foul trouble, but was still active in cheering his teammates on. Click here for more photos from the game. But the real problem was the Lakers applying a fronting defense like he encountered during the Portland series. Pau Gasol ended up fronting Yao many times, and it worked. For some reason, Yao didn’t seem to be fighting all that hard to get open all the time in the paint. And where were the 22-foot jump shot opportunities like he had in Game 1 that he drained? It’s not that hard to get open for those. Not that the defense was all that great, but Yao just doesn’t seem to be able to fight all that hard to get open, either down low in the paint, or even coming out to take 15-20 foot jumpers. And on top of that, he was congesting the lane and not spreading out the defense, such that Aaron Brooks couldn’t drive through open lanes to the bucket, which mitigated the success he had against the Lakers in Game 1. If anything, if Yao can’t get open, the Rockets need to call plays for Brooks because we’ve seen what he can do when he blows by Fisher. After scoring 19 points on 7-of-14 shots in Game 1, Brooks only scored 15 on 5-of-15 shots, with some of those shots made in the fourth quarter after a victory was out of reach. On the bright side, Artest had another good game before getting ejected. 25 points on 8-of-14 shooting. And Carl Landry was the Landry of old, scoring 16 points in the 2nd quarter, although he did miss 5 free throws in that quarter, and finishing with 21. But at least he may be back to his old form under the boards and around the basket, something we hadn’t really seen that much from him since the gunshot wound. There’s so much more to this game I want to write about, but the Fisher-Kobe thing really got me going, it’s getting late, this post is getting long enough, and I’ve got plenty to say about Game 2 for my next post before Game 3. If you want to read some of what Yao had to say after the game, Raymond has transcribed it in the forum here. You are currently browsing the archives for the 2009 NBA playoffs category.